The University of Bonn (German: Rheinische Friedrich-Wilhelms-Universität Bonn) is a public research university located in Bonn, Germany. It was founded in its present form as the Rhein University on 18 October 1818 by Frederick William III, as the linear successor of the Kurkölnische Akademie Bonn (English: Academy of the Prince-elector of Cologne) which was founded in 1777. The University of Bonn offers a large number of undergraduate and graduate programs in a range of subjects and has 544 professors and 32,500 students. Its library holds more than five million volumes. As of August 2018, among its notable alumni, faculty and researchers are 10 Nobel Laureates, 4 Fields Medalists, twelve Gottfried Wilhelm Leibniz Prize winners as well as August Kekulé, Friedrich Nietzsche, Heinrich Heine, Prince Albert, Pope Benedict XVI, Frederick III, Max Ernst, Konrad Adenauer, and Joseph Schumpeter. The university's forerunner was the Kurkölnische Akademie Bonn (English: Academy of the Prince-elector of Cologne) which was founded in 1777 by Maximilian Frederick of Königsegg-Rothenfels, the prince-elector of Cologne. In the spirit of the Enlightenment the new academy was nonsectarian. The academy had schools for theology, law, pharmacy and general studies. In 1784 Emperor Joseph II granted the academy the right to award academic degrees (Licentiat and Ph.D.), turning the academy into a university. The academy was closed in 1798 after the left bank of the Rhine was occupied by France during the French Revolutionary Wars. The Rhineland became a part of Prussia in 1815 as a result of the Congress of Vienna. King Frederick William III of Prussia thereafter decreed the establishment of a new university in the new province (German: den aus Landesväterlicher Fürsorge für ihr Bestes gefaßten Entschluß, in Unsern Rheinlanden eine Universität zu errichten) on 18 October 1818. At this time there was no university in the Rhineland, as all three universities that existed until the end of the 18th century were closed as a result of the French occupation. The Kurkölnische Akademie Bonn was one of these three universities. The other two were the Roman Catholic University of Cologne and the Protestant University of Duisburg. The new Rhein University (German: Rhein-Universität) was then founded on 18 October 1818 by Frederick William III. It was the sixth Prussian University, founded after the universities in Greifswald, Berlin, Königsberg, Halle and Breslau. The new university was equally shared between the two Christian denominations. This was one of the reasons why Bonn, with its tradition of a nonsectarian university, was chosen over Cologne and Duisburg. Apart from a school of Roman Catholic theology and a school of Protestant theology, the university had schools for medicine, law and philosophy. Initially 35 professors and eight adjunct professors were teaching in Bonn. The university constitution was adopted in 1827. In the spirit of Wilhelm von Humboldt the constitution emphasized the autonomy of the university and the unity of teaching and research. Similar to the University of Berlin, which was founded in 1810, the new constitution made the University of Bonn a modern research university. Despite these problems, the university grew and attracted famous scholars and students. At the end of the 19th century the university was also known as the Prinzenuniversität (English:Princes' university), as many of the sons of the king of Prussia studied here. In 1900, the university had 68 chairs, 23 adjunct chairs, two honorary professors, 57 Privatdozenten and six lecturers. Since 1896, women were allowed to attend classes as guest auditors at universities in Prussia. In 1908 the University of Bonn became fully coeducational. The growth of the university came to a halt with World War I. Financial and economic problems in Germany in the aftermath of the war resulted in reduced government funding for the university. The University of Bonn responded by trying to find private and industrial sponsors. In 1930 the university adopted a new constitution. For the first time students were allowed to participate in the self-governing university administration. To that effect the student council Astag (German: Allgemeine Studentische Arbeitsgemeinschaft) was founded in the same year. Members of the student council were elected in a secret ballot. After the Nazi takeover of power in 1933, the Gleichschaltung transformed the university into a Nazi educational institution. According to the Führerprinzip the autonomous and self-governening administration of the university was replaced by a hierarchy of leaders resembling the military, with the university president being subordinate to the ministry of education. Jewish professors and students and political opponents were ostracized and expelled from the university. The theologian Karl Barth was forced to resign and to emigrate to Switzerland for refusing to swear an oath to Hitler. The Jewish mathematician Felix Hausdorff was expelled from the university in 1935 and committed suicide after learning about his impending deportation to a concentration camp in 1942. The philosophers Paul Ludwig Landsberg and Johannes Maria Verweyen were deported and died in concentration camps. In 1937 Thomas Mann was deprived of his honorary doctorate. His honorary degree was restored in 1946. During the second World War the university suffered heavy damage. An air raid on 18 October 1944 destroyed the main building. The university was re-opened on 17 November 1945 as one of the first in the British occupation zone. The first university president was Heinrich Matthias Konen, who was expelled from the university in 1934 because of his opposition to Nazism. At the start of the first semester on 17 November 1945 the university had more than 10,000 applicants for only 2,500 places. The university greatly expanded in the postwar period, in particular in the 1960s and 1970s. Significant events of the postwar era were the relocation of the university hospital from the city center to the Venusberg in 1949, the opening of the new university library in 1960 and the opening of a new building, the Juridicum, for the School of Law and Economics in 1967. In 1980 the Pedagogigal University Bonn was merged into the University of Bonn, although eventually all the teachers education programs were closed in 2007. In 1983 the new science library was opened. In 1989 Wolfgang Paul was awarded the Nobel Prize in Physics. Three years later Reinhard Selten was awarded the Nobel Prize in Economics. The decision of the German government to move the capital from Bonn to Berlin after the reunification in 1991 resulted in generous compensation for the city of Bonn. The compensation package included three new research institutes affiliated or closely collaborating with the university, thus significantly enhancing the research profile of the University of Bonn. In the 2000s the university implemented the Bologna process and replaced the traditional Diplom and Magister programs with Bachelor and Master programs. This process was completed by 2007. The University of Bonn does not have a centralized campus. The main building is the Kurfürstliches Schloss, the former residential palace of the prince-elector of Cologne in the city center. The main building was built by Enrico Zuccalli for the prince-elector of Cologne, Joseph Clemens of Bavaria from 1697–1705. Today it houses the faculty of humanities and theology and the university administration. The Hofgarten, a large park in front of the main building is a popular place for students to meet, study and relax. The Hofgarten was repeatedly the place for political demonstrations as for example the demonstration against the NATO Double-Track Decision on 22 October 1981 with about 250,000 participants. The school of law and economics, the main university library and several smaller departments are housed in modern buildings a short distance south of the main building. The department of psychology and the department of computer science are located in a northern suburb of Bonn. The science departments and the main science library are located in Poppelsdorf and Endenich, west of the city center, and housed in a mix of historical and modern buildings. Notable is the Poppelsdorf Palace (German: Poppelsdorfer Schloss), which was built from 1715 to 1753 by Robert de Cotte for Joseph Clemens of Bavaria and his successor Clemens August of Bavaria. Today the Poppelsdorf Palace houses the university's mineral collection and several science departments; its grounds are the university's botanical garden (the Botanische Gärten der Friedrich-Wilhelms-Universität Bonn). The school of medicine is located on the Venusberg, a hill on the western edge of Bonn. Several residence halls are scattered across the city. In total the University of Bonn owns 371 buildings. The university library was founded in 1818 and started with 6,000 volumes inherited from the library of the closed University of Duisburg. In 1824 the library became legal deposit for all books published in the Prussian Rhine province. The library contained about 200,000 volumes at the end of the 19th century, and about 600,000 volumes at the outbreak of World War II. An air raid on 10 October 1944 destroyed about 200,000 volumes and a large part of the library catalog. After the war the library was housed in several makeshift locations until the completion of the new central library in 1960. The new building was designed by Pierre Vago and Fritz Bornemann and is located close to the main building. In 1983 a new library building was opened in Poppelsdorf, west of the main building. The new library building houses the science, agriculture and medicine collections. Today, the university library system comprises the central library, the library for science, agriculture and medicine and about 160 smaller libraries. It holds 2.2 million volumes and subscribes to about 14,000 journals. The university hospital (German:Universitätsklinikum Bonn) was founded at the same time as the university and officially opened on 5 May 1819 in the Poppelsdorf Palace (German:Poppelsdorfer Schloss) west of the main building. In its first year, the hospital had thirty beds, performed 93 surgeries and treated about 600 outpatients. In 1883 the hospital moved to a new building in the city center of Bonn, and after World War II to the Venusberg on the western edge of Bonn. On 1 January 2001 the university hospital became a public corporation. Although the university hospital is since then independent from the university, the School of Medicine of the University of Bonn and the university hospital closely collaborate. Today the university hospital comprises about thirty individual hospitals, employs more than 670 physicians and more than 1,100 nursing and clinical support staff and treated about 39,000 inpatients. The Akademisches Kunstmuseum (English: Academic Museum of Antiquities ) was founded in 1818 and has one of the largest collections of plaster casts of ancient Greek and Roman sculptures in the world. At this time collections of plaster casts were mainly used in the instruction of students at art academies. They were first used in the instruction of university students in 1763 by Christian Gottlob Heyne at University of Göttingen. The Akademisches Kunstmuseum in Bonn was the first of its kind, as at this time collections at other universities were scattered around universities libraries. The first director was Friedrich Gottlieb Welcker, who also held a professorship of archaeology. His tenure was from 1819 until his retirement in 1854. He was succeeded by Otto Jahn and Friedrich Wilhelm Ritschl, who shared the directorship. From 1870 to 1889 Reinhard Kekulé von Stradonitz, nephew of the famous organic chemist Friedrich August Kekulé von Stradonitz, was the director. In 1872 the museum moved to a new building that was formerly used by the department of anatomy. The building was constructed from 1823 to 1830 and designed by Karl Friedrich Schinkel and Hermann Friedrich Waesemann. Other directors of the museum were Georg Loeschcke (from 1889 to 1912), Franz Winter (from 1912 to 1929), Richard Delbrück (from 1929 to 1940), Ernst Langlotz (from 1944 to 1966), Nikolaus Himmelmann (from 1969 to 1994) and Harald Mielsch (since 1994). All directors, with the exception of Friedrich Wilhelm Ritschl held a professorship of archaeology at the university. The Egyptian Museum (German: Ägyptisches Museum) was founded in 2001. The collection dates back to the 19th century and was formerly part of the Akademisches Kunstmuseum. Large parts of the collection were destroyed in World War II. Today the collection comprises about 3,000 objects. The Arithmeum was opened in 1999. With over 1,200 objects it has the world's largest collection of historical mechanical calculating machines. The museum is affiliated with the Research Institute for Discrete Mathematics. The Teaching Collection of Archaeology and Anthropology (German: Archäologisch-ethnographische Lehr- und Studiensammlung) was opened in 2008. The collection comprises more than 7,500 objects of mostly pre-Columbian art. The Botanical Garden was officially founded in 1818 and is located around the Poppelsdorf Palace. A garden existed at the same place at least since 1578, and around 1720 a Baroque garden was built for Clemens August of Bavaria. The first director of the Botanical Garden was Nees von Esenbeck from 1818 to 1830. In May 2003 the world's largest Titan arum, some 2.74 meters high, flowered in the Botanical Garden for three days. The natural history museum was opened in 1820 by Georg August Goldfuss. It was the first public museum in the Rhineland. In 1882 it was split into the Mineralogical Museum located in the Poppelsdorf Palace and a museum of palaeontology, now named Goldfuß Museum of Palaeontology. The Horst Stoeckel-Museum of the History of Anesthesiology (German: Horst Stoeckel-Museum für die Geschichte der Anästhesiologie) was opened in 2000 and is the largest of its kind in Europe. The Museum Koenig is one of the largest natural history museums in Germany and is affiliated with the university. The museum was founded in 1912 by Alexander Koenig, who donated his collection of mounted specimen to the public. See also the separate article Museum Koenig. The University of Bonn has 32,500 students, and 4,000 of these are international students. Each year about 3,000 undergraduate students graduate. The university also confers about 800 Ph.D.s and about 60 habilitations. More than 90 programs in all fields are offered. Strong fields as identified by the university are mathematics, physics, law, economics, neuroscience, medical genetics, chemical biology, agriculture, Asian and Oriental studies and Philosophy and Ethics. The university has more than 550 professors, an additional academic staff of 3,900 and an administrative staff of over 1,700. The annual budget was more than 570 million euros in 2016. The Franz Joseph Dölger-Institute studies the late antiquity and in particular the confrontation and interaction of Christians, Jews and Pagans in the late antiquity. The institute edits the Reallexikon für Antike und Christentum, a German language encyclopedia treating the history of early Christians in the late antiquity. The institute is named after the church historian Franz Joseph Dölger who was a professor of theology at the university from 1929 to 1940. The Research Institute for Discrete Mathematics focuses on discrete mathematics and its applications, in particular combinatorial optimization and the design of computer chips. The institute cooperates with IBM and Magma Design Automation. Researchers of the institute optimized the chess computer IBM Deep Blue. The Bethe Center for Theoretical Physics "is a joint enterprise of theoretical physicists and mathematicians at various institutes of or connected with the University of Bonn. In the spirit of Hans Bethe it fosters research activities over a wide range of theoretical and mathematical physics." Activities of the Bethe Center include short and long term visitors program, workshops on dedicated research topics, regular Bethe Seminar Series, lectures and seminars for graduate students. The German Reference Center for Ethics in the Life Sciences (German: Deutsches Referenzzentrum für Ethik in den Biowissenschaften) was founded in 1999 and is modeled after the National Reference Center for Bioethics Literature at Georgetown University. The center provides access to scientific information to academics and professionals in the fields of life science and is the only of its kind in Germany. The Center of Advanced European Studies and Research. The Center for European Integration Studies (German: Zentrum für Europäische Integrationsforschung) studies the legal, economic and social implications of the European integration process. The institute offers several graduate programs and organizes summer schools for students. The Center for Development Research (German: Zentrum für Entwicklungsforschung) studies global development from an interdisciplinary perspective and offers a doctoral program in international development. The Center of Advanced European Studies and Research (CAESAR) is an interdisciplinary applied research institute. Research is conducted in the fields of nanotechnology, biotechnology and medical technology. The institute is a private foundation, but collaborates closely with the university. The Institute for the Study of Labor (German: Forschungsinstitut zur Zukunft der Arbeit) is a private research institute that is funded by Deutsche Post. The institute concentrates on research on labor economics, but is also offering policy advise on labor market issues. The institute also awards the annual IZA Prize in Labor Economics. The department of economics of the University of Bonn and the institute closely cooperate. The Max Planck Institute for Mathematics (German: Max Planck-Institut für Mathematik) is part of the Max-Planck-Gesellschaft, a network of scientific research institutes in Germany. The institute was founded in 1980 by Friedrich Hirzebruch. The Max Planck Institute for Radio Astronomy (German: Max-Planck-Institut für Radioastronomie) was founded in 1966 as an institute of the Max-Planck-Gesellschaft. It operates the radio telescope in Effelsberg. The Max Planck Institute for Research on Collective Goods (German: Max-Planck-Institut zur Erforschung von Gemeinschaftsgütern) started as a research group in 1997 and was founded as an institute of the Max-Planck-Gesellschaft in 2003. The institute studies collective goods from a legal and economic perspective. The Center for Economics and Neuroscience founded in 2009 by Christian Elger, Gottfried Wilhelm Leibniz Prize winner Armin Falk, Martin Reuter and Bernd Weber, provides an international platform for interdisciplinary work in neuroeconomics. It includes the Laboratory for Experimental Economics that can carry out computer-based behavioral experiments with up to 24 participants simultaneously, two magnetic resonance imaging (MRI) scanners for interactive behavioral experiments and functional imaging, as well as a biomolecular laboratory for genotyping different polymorphisms. The Electron Stretcher Accelerator ELSA at the Department of Physics. University of Bonn researchers made fundamental contributions in the sciences and the humanities. In physics researchers developed the quadrupole ion trap and the Geissler tube, discovered radio waves, were instrumental in describing cathode rays and developed the variable star designation. In chemistry researchers made significant contributions to the understanding of alicyclic compounds and Benzene. In material science researchers have been instrumental in describing the lotus effect. In mathematics University of Bonn faculty made fundamental contributions to modern topology and algebraic geometry. The Hirzebruch–Riemann–Roch theorem, Lipschitz continuity, the Petri net, the Schönhage–Strassen algorithm, Faltings's theorem and the Toeplitz matrix are all named after University of Bonn mathematicians. University of Bonn economists made fundamental contributions to game theory and experimental economics. Famous thinkers that were faculty at the University of Bonn include the poet August Wilhelm Schlegel, the historian Barthold Georg Niebuhr, the theologians Karl Barth and Joseph Ratzinger and the poet Ernst Moritz Arndt. The university has nine collaborative research centres and five research units funded by the German Science Foundation and attracts more than 75 million Euros in external research funding annually. The Excellence Initiative of the German government in 2006 resulted in the foundation of the Hausdorff Center for Mathematics as one of the seventeen national Clusters of Excellence that were part of the initiative and the expansion of the already existing Bonn Graduate School of Economics (BGSE). The Excellence Initiative also resulted in the founding of the Bonn-Cologne Graduate School of Physics and Astronomy (an honors Masters and PhD program, jointly with the University of Cologne). Bethe Center for Theoretical Physics was founded in the November 2008, to foster closer interaction between mathematicians and theoretical physicists at Bonn. The center also arranges for regular visitors and seminars (on topics including String theory, Nuclear physics, Condensed matter etc.). According to the 2015 Academic Ranking of World Universities compiled by researchers of the Shanghai Jiao Tong University the University Bonn was ranked 97th internationally. In the 2015/16 Times Higher Education World University Rankings, the university placed 94th. Among its notable alumni and faculty are Pope Benedict XVI, Karl Marx, Joseph Goebbels, Heinrich Heine, Heinrich Hertz, Maria von Linden, Friedrich Hirzebruch, Friedrich Nietzsche, Friedrich August Kekulé von Stradonitz, Syed Mujtaba Ali, Joseph Schumpeter, Konrad Adenauer, Max Ernst, Constantin Carathéodory, Karl Weierstrass, Mehmet Celal Bey, Karl Barth, Wolfgang Kaleck, Johannes Sobotta, Margaret Altmann, Hans Riegel, Samson Raphael Hirsch and Sebastian Thrun. ^ a b c d e "University of Bonn at a glance". University of Bonn. Retrieved 2017-06-03. ^ Johann Friedrich Wilhelm Koch: Die Preussischen Universitäten, vol. 1, Berlin: Posen und Bromberg: 1839, pg. 176. ^ Becker, Thomas P. (May 2007). "Geschichte der Rheinischen Friedrich-Wilhelms-Universität". Archived from the original on 2007-06-09. Retrieved 2008-02-08. ^ Haus der Geschichte der Bundesrepublik Deutschland. "Weg der Demokratie – Path of Democracy". Retrieved 2008-02-08. ^ Universitäts-und Landesbibliothek Bonn (October 2003). "Geschichte der ULB Bonn". Archived from the original on 2007-11-27. Retrieved 2008-02-08. ^ Universitätsklinikum Bonn. "Homepage of the University Hospital Bonn". Retrieved 2008-02-08. ^ University of Bonn (January 2008). "Official Homepage of the Akademisches Kunstmuseum". Archived from the original on 2008-02-10. Retrieved 2008-02-08. ^ Egyptian Museum of the University of Bonn (September 2006). "Official Homepage of the Egyptian Museum". Archived from the original on 2007-11-24. Retrieved 2008-02-08. ^ Arithmeum. "Official Homepage of the Arithmeum". Archived from the original on 2008-02-18. Retrieved 2008-02-08. ^ University of Bonn. "Museums and Academic Collections". Archived from the original on January 18, 2008. Retrieved 2008-02-08. ^ Botanic Garden of the University of Bonn. "Official Homepage of the Botanic Garden". Retrieved 2008-02-08. ^ "Das Mineralogische Museum". uni-bonn.de. Uni Bonn. ^ Institute of Paleontology. "Geschichte des Museums und des Gebäudes". Archived from the original on 2008-01-26. Retrieved 2008-02-08. ^ University Hospital. "Horst-Stoeckel-Museum für die Geschichte der Anästhesiologie". Retrieved 2008-02-08. ^ Zoologisches Forschungsmuseum Alexander Koenig. "Official Homepage of the Museum Koenig". Retrieved 2008-02-08. ^ "Faculties". University of Bonn. Retrieved 2018-02-04. ^ F.J. Dölger-Institut. "Official Homepage of the F.J. Dölger-Institut". Archived from the original on 2009-03-14. Retrieved 2008-02-08. ^ Research Institute for Discrete Mathematics. "Research of the Institute for Discrete Mathematics". Retrieved 2008-02-08. ^ Karnbach, Bodo (October 2000). "Chip-Design mit diskreter Mathematik - Weltweit erfolgreiche Kooperation verlängert". Archived from the original on September 30, 2007. Retrieved 2008-02-08. ^ Bethe Center for Theoretical Physics. "Official Homepage of the BCTP". Retrieved 2009-03-25. ^ German Reference Center for Ethics in the Life Science. "Official Homepage of the DRZE". Retrieved 2008-02-08. ^ Center for European Integration Studies. "Official Homepage of the ZEI". Retrieved 2008-02-08. ^ Center for Development Research. "Official Homepage of the ZEF". Archived from the original on 2008-02-27. Retrieved 2008-02-08. ^ "Website of the institute". ^ Shanghai Jiao Tong University (2015). "Top 500 World Universities". Archived from the original on January 20, 2016. Retrieved 2016-02-13. ^ "World University Rankings 2016". Times Higher Education. Retrieved 13 February 2016. 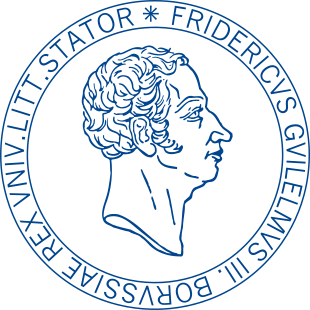 Wikimedia Commons has media related to Rheinische Friedrich-Wilhelms-Universität.